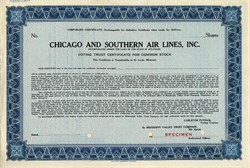 Beautiful engraved specimen stock certificate from the Chicago and Southern Air Lines printed in 1940. This historic document was printed by Security Bank Note Company and has an ornate border around it with the company's name on top center. Chicago and Southern Air Lines started life as Pacific Seaboard Air Lines, which was organized on June 15, 1933. The first service was on June 23 in Carleton Putnam's Bellanca CH-300 "Miss San Jose." Putnam held a Transport Pilot's license. Three Bellanca CH-300s were used in the California operation. The new airline only flew passengers on the West Coast of California on "The Scenic Route." This route was up the coast of California from Los Angeles (Grand Central Air Terminal at Glendale) to San Francisco'sMills Field. Stops were made at seven cities near the Pacific Ocean. For a short period, Pacific Seaboard Air Lines flew from San Francisco to the capital of California, Sacramento. The competition, on the LA-SF route, was United Airlines with twin-engine, ten-passenger, Boeing 247s. United, who flew the valley route, had the Air Mail contract and more comfortable aircraft. Putnam decided the only way he could stay in business was to get a U.S. Air Mail contract. In four months and oneweek, 1113 passengers were carried. On February 9, 1934, President Franklin D. Roosevelt canceled all the U.S. Mail contracts. The U.S. Army operated the air postal service for a few weeks and then the government called for a new bidding of the Air Mail routes. Mr. Putnam bid on and received the Air Mail route between Chicago and New Orleans by way of Peoria, Springfield, St. Louis, Memphis and Jackson (Air Mail Route 8). Two more Bellanca CH-300s were purchased, bringing that fleet to five aircraft. He had to start service in 30 days or he would forfeit his $50,000 performance bond. Air Mail service started June 3, 1934, and passenger service started June 13 with the five Bellancas on "The Valley Level Route." The airline changed its name to Chicago & Southern Air Lines in 1935. In 1953, Delta Air Lines merged with Chicago and Southern Airlines, giving it access to a Great Lakes route system in the upper Midwest and, importantly, to points in the Caribbean Sea.